â€œCan I sell to a giant like IBM, P&G, Google or Cisco?â€ â€” Sure you can! 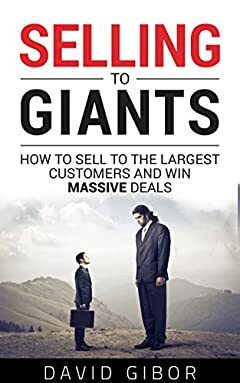 Whether you work in a large company or own a three people business, you CAN sell to giants, enjoy repeat business and close deals which are MUCH LARGER than you imagine are possible. This book will teach you how! â€œSelling To Giantsâ€ is a playbook for anyone who would like to take his business to a new level by working with very large customers. It is intended for Business to Business (B2B) sales professionals, entrepreneurs, business owners, and executives. It is relevant to people who are selling products or services to customers which are very large organizations, such as large companies, financial institutes or governments. â€¢Prepare yourself for the first meeting, and make sure you get a second one! David Gibor has been selling to giants for over three decades. He has worked in startups selling to large telecom operators, in giant defense companies selling to countries, and advised to companies in multiple industries. The author has repeatedly closed 8 & 9 digit deals (>$100M) In the recent years the author has been also responsible for large projects in a giant organization and has been a buyer from smaller suppliers. His share of successes and failures as a seller and his intimate view of the buyer perspective have helped him fine-tune and clearly define a playbook for business success with giants.